77-year-old Sheila Marsh was a true animal lover and an altogether kind woman throughout her lifetime. The elderly woman was the proud owner of six horses, three dogs, three cats, and a variety of other animals. Unfortunately, Sheila Mrash had to leave her beloved animals behind when she was in the hospital due to cancer and nearing death. A final visit from her dogs sparked one last wish from Mrs. Marsh: She wanted to see her favorite horse Bronwen one last time before passing away. She had previously taken care of the horse for the last 25 years and had formed a strong bond with it! 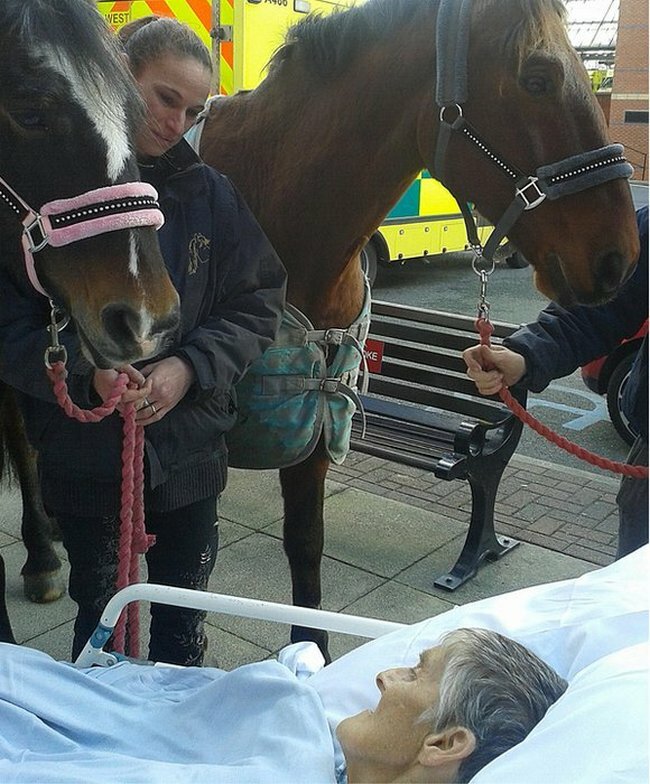 The logistics were a little difficult, because you can’t just walk a massive horse into a hospital room, but the amazing staff at Royal Albert Edward Infirmary in Wigan, England made the seemingly impossible happen for the animal lover about to pass away. They brought the horse to her!